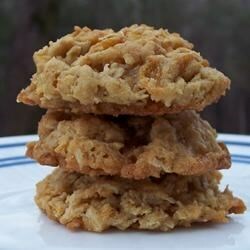 "Hearty cookie with oats, coconut and wheat flakes cereal. Great for a snack. " In a large bowl, cream together the shortening, white sugar and brown sugar until smooth. Beat in the eggs one at a time, then stir in the vanilla. Combine the baking powder, baking soda and oats; stir into the sugar mixture. Fold in the wheat cereal, and coconut. Drop dough by teaspoonfuls onto the prepared cookie sheets. Flatten slightly with a fork. Bake for 10 to 12 minutes in the preheated oven, or until light brown. Cookie-stuffed cookies are twice the yum! The cookies were way too runny and fell all over the oven.